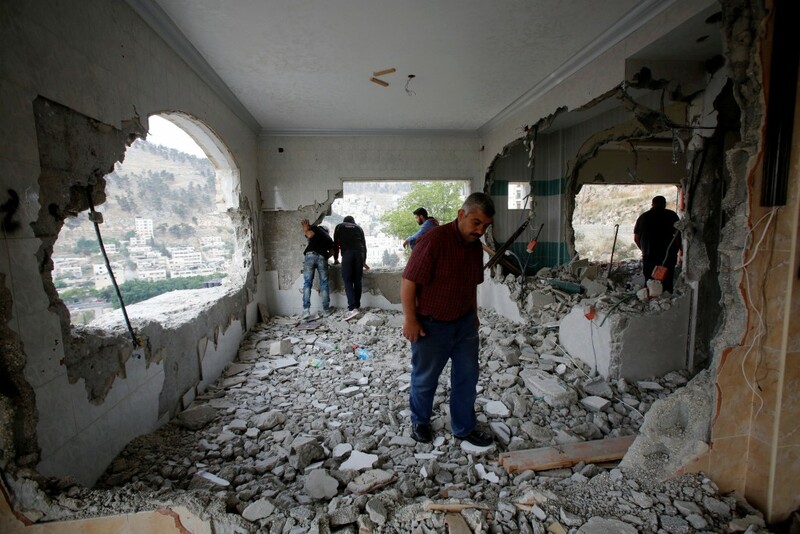 IDF soldiers overnight Monday demolished the home of Ziyaf Jamal Amar in Shechem. Amar was one of several terrorists involved in the murders of Eitam and Naomi Henkin, Hy”d, on Chol Hamoed Sukkos; one of the first terror attacks in the recent terror wave. The Henkins were murdered in a shooting attack on the road between Itamar and Elon Moreh in the Shomron. IDF troops several days later arrested five terrorists, who under questioning admitted that they had planned and participated in the murders. Officials said that the terrorists had seen the couple’s four young children in the back seat – but did not shoot them because Eitam Henkin, Hy”d, had defended his children bodily, and was unable to shoot them because they had delayed too long in killing their father. The latest demolition marks the destruction of all the homes of the families of the terrorists involved in the shootings. Three of the homes were demolished last November, and one was demolished earlier this month. The reason for the delay in the demolition of the latter two houses was due to an appeal by the families of the terrorists to the High Court, claiming that since they did not pull the trigger, they did not deserve the same punishment as the others. In other security events, overnight Monday, security officials said they arrested 18 wanted security suspects in other areas in Yehudah and Shomron. The suspects were wanted for participating in rioting and throwing stones and firebombs that endangered Israeli civilians and IDF soldiers. Several of the suspects were also charged with belonging to Hamas. All were being questioned on their activities by security forces.